Residents woke up to heavy rain in Abu Dhabi early on Saturday, while forecasters warned of strong winds and very rough seas on the Arabian Gulf. Rainy convective clouds accompanied by thunder at times hovered over a wide swath of the UAE, while up to 9-foot waves are expected in the Arabian Gulf on Saturday. The National Centre of Meteorology raised yellow and orange alerts covering most of the country on Saturday. Dubai and Fujairah also saw light rain on Saturday morning. Weathermen expect dusty and rainy weather to continue until Tuesday. 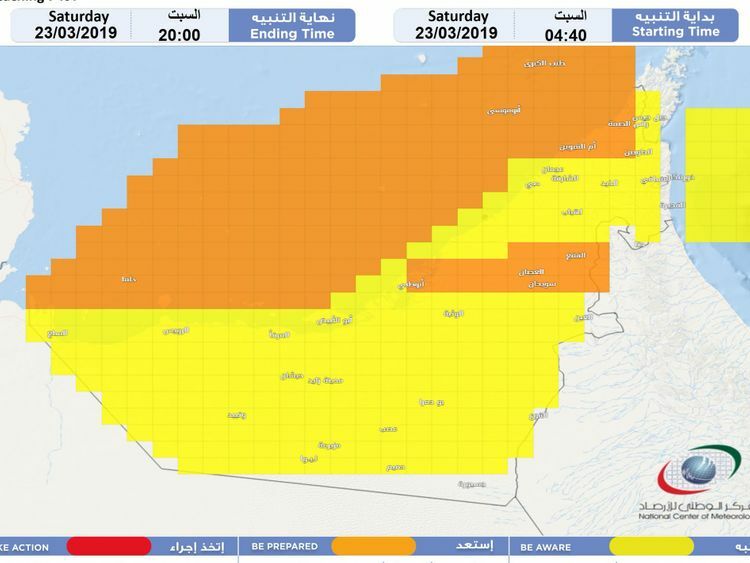 Strong winds brought by fresh southerly to northerly winds are expected to kick up blowing dust over exposed areas, the National Centre of Meteorology stated.